OCMC Executive Director Fr. Martin Ritsi and OCMC Missionary Director Dn. James Nicholas visited OCMC missionaries serving in Guatemala and even got to help train catechists during their time. OCMC Executive Director Fr. Martin Ritsi, and OCMC Missionary Director Dn. 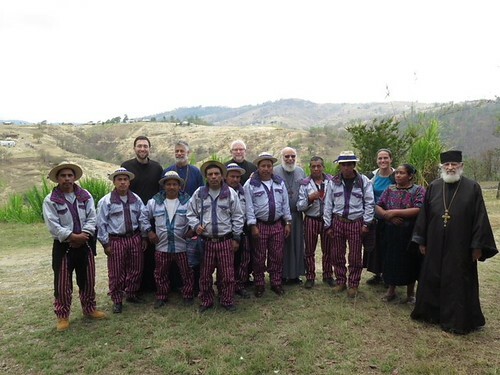 James Nicholas, recently returned from a trip to Aguacate, Guatemala. While there, they witnessed the work being done by OCMC long-term missionaries Archimandrite Juvenal Repass, Jesse Brandow, Jennifer Rice, and Fr. John and Pres. Sandy Chakos. They are serving an ever growing body of believers who are being guided in the Faith by Guatemalan clergy like Fr. Evangelios Patá who has become a leading force in the Church after the passing of Fr. Andres Giron several years ago. Upon his arrival, Fr. Martin joined in a training for catechists. The sessions, spanning two days, focused on confession and repentance. Catechists are gathered together three to four times a year for training and fellowship. These men are vital to the life and continued growth of the Church. Presently there are only a handful of clergy and hundreds of parishes. Catechists help lead and teach communities of the faithful between visits from the priests. The Church of Guatemala has been steadily growing. In Aguacate, they have established facilities that function as a Missionary center providing missionary housing. Also in Aguacate, the Fr. Andres Giron Clinic now has a full-time doctor and dentist. There is also a small seminary with five students, taught by Jesse and Fr. Evangelios. Pres. Sandy Chakos works with women to sew vestments to help support the Church. With his fluency in Spanish increasing, Jesse Brandow has taken a leadership role in Guatemala. Guided by Fr. John, Jesse and Fr. Evangelios are primarily responsible for teaching students at the seminary. He puts together a church calendar with readings and feast days that are distributed to Guatemala’s many parishes every quarter. He also helps to coordinate the OCMC short-term teams that visit throughout the year. Fr. Juvenal helps administer the sacraments, allowing Fr. Evangelios to travel to the surrounding parishes. Fr. Juvenal also leads daily liturgical life at seminary and has begun translating liturgical texts into Spanish. Jennifer Rice just completed one year in Guatemala. She continues to learn the language and culture as she works closely with Jesse. She, and the other missionaries, are much beloved by the people in Guatemala. Please keep them all in your prayers. If you’d like to witness the amazing growth of the Church in Guatemala first-hand, consider joining a 2018 short-term mission team by visiting www.ocmc.org or by calling 1-877-463-6784.